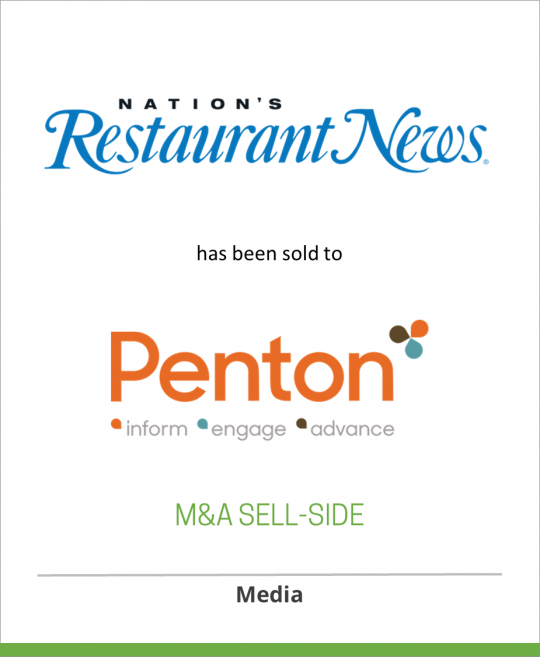 DeSilva+Phillips client Lebhar-Friedman, Inc. announced today that they have sold Nation’s Restaurant News (NRN), the number one publication serving the foodservice industry, to Penton Media, a leading, independent business-to-business media company. NRN‘s readers are made up of the decision-makers in the foodservice industry, from operation managers to owners and senior management. In 2010, BtoB Magazine again named NRN to its elite BtoB Power 50. NRN is widely recognized as the number one publication in its space. The magazine’s circulation is over 60,000 with a full franchise of print, online and special events. Lebhar-Friedman, Inc. has leveraged an 80-plus-year history of publishing excellence and is among the country’s leading B2B and healthcare media companies.Headquartered in New York City, with leading B2B titles such as Nation’s Restaurant News, Drug Store News and Chain Store Age, Lebhar-Friedman’s business units are dedicated to providing executives, professionals and clients with timely and relevant information online and in print. The Nation’s Restaurant News division is based in Lebhar-Friedman’s New York City office.